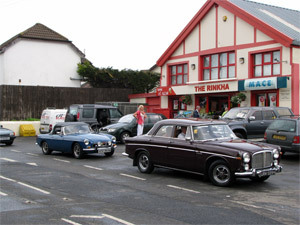 The Rinkha News: Family shop contributing to Islandmagee's community. As a family, we at The Rinkha have always understood the importance of the development and evolution of our shop to meet the needs of our customers. As the Islandmagee community show their loyalty when they shop with us, we want to give back and do everything we can to contribute to the community when we can. The Rinkha stocks a wide range of products from toys and games to hardware and household goods. As such our shop changes with the seasons – in summer the emphasis is on summer toys and gardening equipment while in autumn we start to receive our Christmas toy deliveries. So keep checking back. 22.07.2014: New Gobbins Book Available now! We recently opened our new dance hall themed cafe at The Rinkha. There was music, local celebrity George Jones and lot's of ice cream consumed on the night. It was also the first time The Rinkha experienced people dancing on the original Canadian sprung maple dance floor for forty-five years. Call in and try some of our gourmet coffee and try a desert from our new ice cream menu. If you've been in The Rinkha lately, you may have noticed that we are making some changes and improvments to the shop. We can't say too much just yet, but rest assured - all will be revealed soon. A new book "Skye and the Swallows" by local woman Hilary M Bailey is available in store now. It's a lovely childrens book about a dog called Skye and his adventures in the area. Copies are moving fast so why not call in and grab a copy now. A lovely Christmas gift! Call in and try our new flavour - Gobbins, Goblin, Goop. many themes including Farm, Wild life, Dragon Knights, Ghost Pirates, Mega Construction, Fire Rescue and The School range. The much anticipated new book - Islandmagee & Templecorren - A Postcard History was launched recently and continues to sell well at The Rinkha. This is a limited edition run, so get your copy fast! After 20 successful years in the heart of Larne, we have decided to return our focus to our flagship store in Islandmagee. We have enjoyed serving the community in Larne, but with the changing trend in the toy market, we felt this was the best decision for our customers. 2010 is going to see some exciting new developments at The Rinkha, and we look forward to this new chapter in our colourful history. 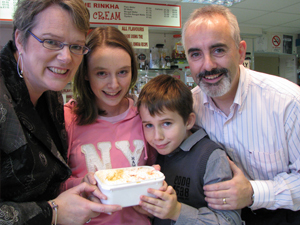 Congratulations to The McBride Family - our overall Flavour of the Month Competition winners! We hope you enjoy your Rinkha ice cream. We are delighted to announce that two of our longest serving staff, Margaret Hamilton and Joan Jones both celebrated 20 years with us this month. We are delighted to have them with us - as the Rinkha is still an independent, family-run store, and we consider them part of our family. They are a true asset to us, and we are very grateful to have them. Thanks Margaret and Joan! 08.09.09: The Rinkha Flavour of the Month Winners. 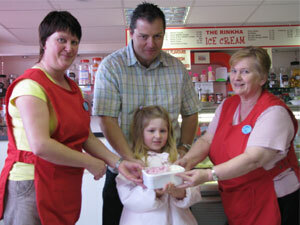 Congratulations to The McAllister Family our September Flavour of the Month Competition winners! We hope you enjoy your Rinkha ice cream. 08.08.09: The Rinkha Flavour of the Month Winners. Congratulations to The McClean Family our August Flavour of the Month Competition winners! We hope you enjoy your Rinkha ice cream. 08.07.09: The Rinkha Flavour of the Month Winners. Congratulations to John & Jane Crawford-Baker our July Flavour of the Month Competition winners! We hope you enjoy your Rinkha ice cream. 08.06.09: The Rinkha Flavour of the Month Winner. Congratulations to Aisling Dean our June Flavour of the Month Competition winner! 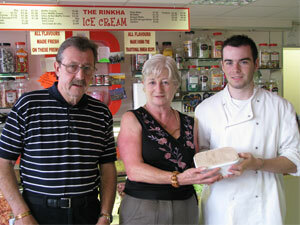 We hope you enjoy your Rinkha ice cream. 08.05.09: The Rinkha Flavour of the Month Winner. 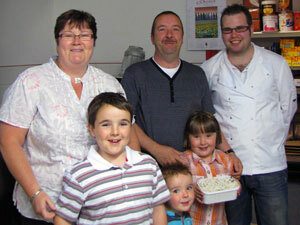 Congratulations to the Kerr Family our May Flavour of the Month Competition winners! We hope you enjoy your Rinkha ice cream. 08.04.09: The Rinkha Flavour of the Month Winner. We were very pleased to announce our April Flavour of the Month Competition winner was Lorna Cameron, Congratulations Lorna! We hope you enjoy your Rinkha ice cream. 26.06.09: The all-new Rinkha website is launched with much help and work by Melanie at Fulton Advertising. To keep you up to date on our offers and give everyone a little background on the family shop that we take so much pride in, we launch therinkha.com. We hope it gives you all the information you need, but if there is anything you think we've missed or something you think could make it better please let us know by emailing us at info@therinkha.com. In April 2009 we were joined by Fire Spinning Artist Clare Palmer for the launch of our fantastic Flavour of the Month Competition. The first delicious new flavour, Creme Egg fice cream, was introduced with a bang. 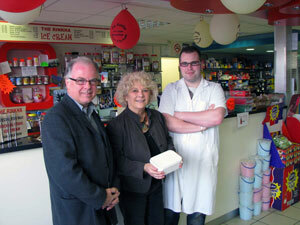 Find out more about your chance to win ice cream every month for a year here. 30.03.09: The Rinkha sponsor the Mullaghdubh Primary School football team. We were very pleased to be able to offer our support to the Mullaghdubh Primary School team, good luck in all your matches kids! 28.03.09: The Rinkha competition website is launched. To mark the opening of our fantastic Flavour of the Month competition we launched the first stage of therinkha.com, to see the competition section of the site click here.